(furniture, boxes, vehicles, etc. ), from Spain to Ecuador. We use 20feet or 40feet maritime containers to send your belongings. The capacity is equivalent to 30 cubic meters (20ft containers) and 60 cubic meters (40ft containers). In groupage removals you can only occupy up to 20 cubic meters of your personal belongings furniture and boxes. The 20 feet containers are ideal for moving entire floors with furniture, boxes and home appliances. The 40 feet containers are ideal for complete removals with furniture, home appliances, boxes and your car. 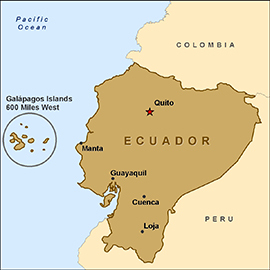 All of our maritime removals to Ecuador start from your residence in Spain to the port of Guayaquil in Ecuador. Here in Spain we give to you all the legal documentation that is required to carry on your international removal process. Every 10 days ships depart with an estimated arrival date of 25 days after the departure to reach the port.